The Rest of the Story. Back in 2009 I tested the then brand-new Grand Trunk Nano 7—arguably the lightest hammock still on the market. 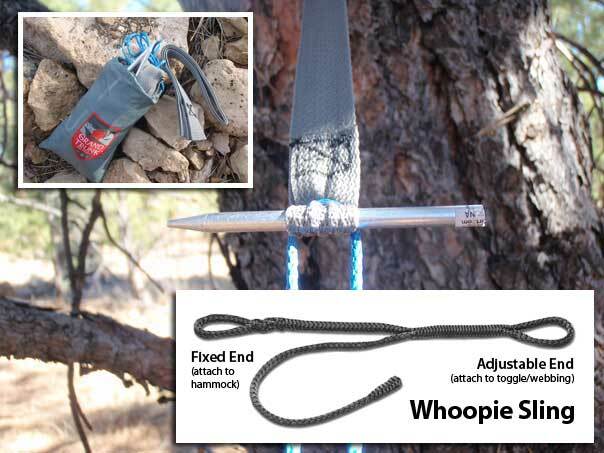 What makes this review unique and transformative for me was that during the test the Whoopie Sling was introduced to hammock camping. At the time, I was playing with different suspension options, including a two-inch webbing strap. I was still accustomed to how my Hennessy Hammock was configured, with a long rope coming from the hammock connected to webbing straps. I had given up on the figure-8 wrap, simply because it made it difficult to adjust the hammock, but I still used a long rope. At the time, I thought my carabiner method with a slippery Lark’s head knot was the quickest, easiest way to rig a hammock. I remember buying up yards of Amsteel Blue, and with fid in hand, setting to work installing Whoopie Slings directly into the gathered ends of my hammocks—no Lark’s head here. I’m not sure why I did this, it was a crazy waste of time and offered virtually no benefit, but it was a great training ground for future do-it-yourself projects with Amsteel I would do in the future[2. I no longer install Whoopie Slings in this way, preferring to use a short continuious loop in the channel and connecting a Whoopie to this loop via a Lark’s Head knot]. These were exciting times, and there seemed to be a sort of competition in the air between hammock aficionados on figuring how long the bury should be or whether the brummel should be stitched or woven. In these early days of hammock suspension innovation, you couldn’t buy Whoopie Slings off the shelf. In order to get a pair, you either knew a friend who made them or you made them yourself. It didn’t take long before the market opened up and “Opie” launched WhoopieSlings.com. Today, nearly every cottage hammock vendor sells Whoopie Slings in a variety of colors[3. At the time, the only Amsteel available was blue, hence the name “Amsteel Blue.”]. It was during this time that other innovations in hammock suspension were being tried out, including UCRs. It was also during this gear test that I got my first bonafide under quilt! Up to this point I was still using pads and some experiments with cocoon sleeping bags. I was working with HammockGear.com founder Adam Hurst with his website and branding. He was still early on with his business as under quilts were just starting to gain momentum. As I was testing the Nano 7 in the winter, I asked for a 20°F (-7°C) quilt set with some overstuff. Getting that under quilt and top quilt was like getting into a hammock again for the first time. Looking back, I had almost forgotten the natural ergonomic comfort from a naked hammock (e.g. no pad). An under quilt liberated the hammock and transformed my experiences once again. I hope you enjoy this review of the Nano 7 and this step back in time! I have the Nano 7 now and use it for backpacking even though I think it’s a little short for me. I will use a heavier hang if I don’t have to pack it in. You might be interested in the BIAS Micro Weenie hammock. It’s only 6 oz. but has a much longer length. You might find it more comfortable. I’ve got a review on it coming out soon. I would definitely like to try one out. Well, when are you coming back thru Flagstaff? I don’t think the wildflowers are up yet, but you’re welcome to borrow mine and try it out. I’ll actually be driving through tomorrow on my way up to Zion. Won’t have time to hang out but will be rolling through Fri and then back on Sunday. I will def be up there for the wildflower show though. Have a great trip! I grew up not from from Zions and love it. I will start off by saying I have asked for your book for Christmas and was really trying not to ask specific questions until i have read all of it but I just can’t seem to help myself. I have a GT Ultralight but my question is about the suspension (and attaching it) so I assume that is appropriate to ask here. Basically the question is why do people whip the end of their hammocks? I have simply run the fixed end of my whoopie sling through the channel that is sewn into the hammock. Is this configuration a recipe for disaster (failure of the sewn in channel maybe)? 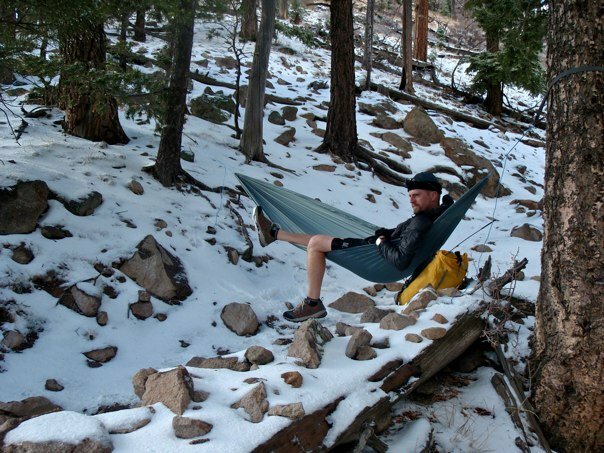 For hammocks with a channel, particularly commercially-made hammocks like the Grand Trunk Ultralight, the channels are sewn with heavy-duty thread and are designed to hold the listed weight capacity. These hammocks usually have three lines of sewing reinforcement. It is true that a hammock sewn with thin thread poses a risk for failure, but that is more likely with do-it-yourself versions. Using an end-channel to thread your suspension is the preferred way to attach the suspension if your hammock is so equipped. Just thread your suspension into the channel and you’re good to go. “Whipped”-end hammocks are more common with do-it-yourself projects, especially for those who lack sewing skills, a sewing machine, or are looking for a no-sew option. Whipped hammocks, where you simply gather up the material on the end and bunch it up, doesn’t work with every type of fabric. In my post about making a hammock in 3 minutes, I show two methods for whipping a hammock, but these hammocks use fairly thick material that creates a “knot” of sorts that prevents the suspension from slipping off. I made a few whipped-end hammocks for my kids a few Christmases ago and the material was so light that the suspension slipped off. This is a big risk. I had to try a different method. The second way to whip a hammock is to sew a simple channel and use string or even a zip tie to gather the end up into a ball and then wrap the suspension around the end of the hammock. I hope this makes sense. Email me if you have further questions. Illustrations in my book will also help.